Because this week is coming to a close - and that's always a reason to celebrate - I am bringing you another spring trend directly from the runway! Today's focus is on minimalist dressing. OK, I must admit, this is a bit of a challenge for me. I'm of the mind that the more bracelets, jackets, vests and scarves you add to the outfit the more fabulous it becomes! But, for the sake of fashion, I am going to put down the chandelier earrings and cocktail rings and give minimalism a try. Keeping in mind that this is a challenge, we're going to tackle this trend with an all-white ensemble. I absolutely love the easiness of this look. It says, "I'm enough on my own....I don't 100 bangles clinking together to be noticed." I've chosen a few looks from Jil Sander and Calvin Klein, (two houses that are certainly the authority on minimalism.) along with a few others for inspiration. 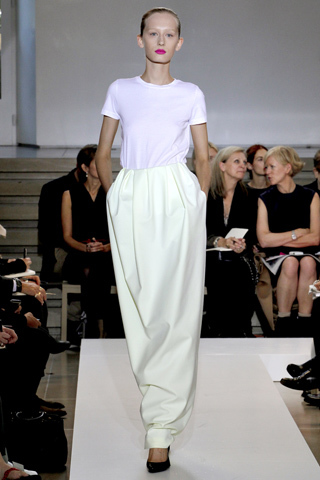 Jil Sander - Spring 2011 - At least we can add hot pink lips and still be "minimal"! Bottega Veneta - Spring 2011 - A few accessories, but simple hair and sheath. Max Azria - Spring 2011 - Obsessed with the slits in this dress! Hot! ﻿I think I will work this trend at a fun party or dinner with my husband. With that in mind, here is what I came up with. All you need is a simple white sheath dress, and architectural accessories. To keep it minimalist, just slick your hair back in a bun or a sleek pony and add a punch of color on the lips. I think this is a minimal look even I can rock!